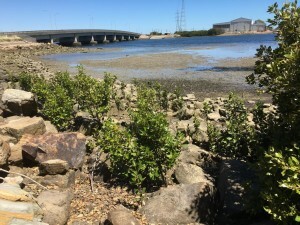 AMWRRO is extremely happy with the progress of the Grey Mangrove Revegetation Project that was made possible thanks to project partner ElectraNet and the Australian Government – Caring for our Country Grant in 2012. To date there are over 385 established Grey Mangrove Trees that are slowly but surely creating a new Grey Mangrove Forest on the south Causeway leading to Torrens Island. These trees will encourage and sustain marine wildlife within the Port River Estuary system and this is now seen on a regular basis on mid/low tide. Several shore and wading bird species have since returned to the area and are seen foraging on the exposed mud flats. Before this area was restricted, it was subject to excess bait digging activities of which left these mud flats barren and lifeless. Today this area is transforming itself into a wildlife safe haven that will create additional habitat for countless marine life and sea bird species. Special thanks to project partner ElectraNet for their initial and ongoing support; fantastic project success would not have been possible without your involvement. This revegetation project is the largest Grey Mangrove revegetation project that has been undertaken in South Australia and is a great success story for our famous Port River Dolphins. These amazing mammals have been subject to habitat destruction and loss for many years in a row, now for the first time they have had habitat added to their home environment and not taken. Dolphins are seen on a daily basis in and around this area on mid/high tides herding fish and enjoying this area. Avicennia marina (grey mangrove) belongs to the Avicenniaceae family. It is the most common and widespread mangrove found along the mainland coast of Australia. It is the only mangrove species able to withstand the cooler climates of South Australia and Victoria. Grey mangrove occurs in intertidal zones on a range of soft muds to sandy soils. It is common along the tidal margins of estuaries and along saline or brackish river areas where it may grow with river, red and other mangrove species. As a pioneer species, grey mangrove commonly colonises developing mud banks. Grey mangrove generally grows to 25 m high, though trees of 10 to 15 m are common in Queensland under favourable conditions. Trees have a large trunk covered by light grey, finely fissured bark that supports a spreading leafy crown. Leaves measure up to 8 cm in length and 5 cm in width. They are oval, pointed and arranged opposite one another on the stems. The leaves are glossy green above with a distinctive pale and slightly hairy, grey underside. Stomata (pores) and salt glands are scattered over the entire leaf surface but are more abundant on the underside. Flowers are small and yellow, and appear in clusters. A distinguishing feature of this species is the numerous spongy pencil-like pneumatophores (peg-like roots) that spread out from the base of the trunk. Pneumatophores originate from horizontal, underground lateral roots and grow vertically through the soil surface to enable the mangrove roots to breathe. The peg-like roots of the grey mangrove can form a dense covering over the ground. Flowering occurs in mid to late summer. The pale green, flattened fruits (3 cm long and 2 cm wide) consist of a thin, hairy seed coat and enclose two closely folded seed leaves. The seeds germinate while attached to the tree (vivipary), which allows for quick establishment once the seed settles. As a pioneer species, grey mangrove is very tolerant of extreme saline conditions as it actively resists the uptake of salt at the roots. Grey mangroves can also withstand short periods of inundation by freshwater or hypersaline water (salinity exceeding that of seawater). However, all mangroves are susceptible to extended periods of waterlogging, with death occurring within 14 days. Australian Aboriginals and Europeans used grey mangrove timber for shields and boat building respectively due to its light weight and strength. Grey mangrove timber was also an important resource for oyster growers in the 1900s, which led to the protection of mangroves under early fisheries legislation. Grey mangroves stabilise river banks and channels, provide areas for spat settlement in oyster culture, act as a source of pollen for beekeepers, and provide suitable habitats for waterbirds and juveniles of important recreational and commercial fish species. Grey mangroves also increase the amenity value of our waterways by screening development and buffering storm surges and wind.